We have reviews of the two latest fantasy novels by Anne Bishop-Written In Red and Murder of Crows. Details at the end of this post on how to win both! Sometimes, a book comes along that has so many fantastic concepts that you have to stop and say, “I wish I’d written that.” Anne Bishop’s Written in Red is one of those books. In Bishop’s world, the Others were created first: the Wolfkind, the Vampires, the Crows, and other creatures we’d consider legends. Humans came along later, looked on as easy meat, but tolerated for their inventing abilities. Humans are limited to small towns surrounded by the terra indigene/Earth Natives/Others. In the few cities, Courtyards are established, embassies of Others that deal with the human infestation and interact for business purposes. Into this uneasy environment rushes Meg, who becomes the interface, the Human Liaison, of the Lakeside Courtyard. She sorts the mail and makes friends with frightening creatures who won’t eat her because she doesn’t smell like Prey. She is human, but different: a cassandra sangue, a blood prophet. Cut her skin, and with the blood comes prophecies and intense, orgasmic feelings. The desire for that release has led to their institutionalization and exploitation where the girls have numbers instead of names. Meg escaped that, and she is so valuable that her owners will kill for her return. A shaman bear, a coyote, seasonal elementals, a wolf-cub with trauma-induced delayed development, ponies that become horses of destruction, and a coffee-shop owner whose hair tells how close she is to killing are part of the Courtyard, led by Simon Wolfgard, who doesn’t understand this human/not-Prey he has given refuge. There are non-Others : a police detective who came to Lakeside because he had saved an Other instead of a human, delivery men who refuse to give packages to beings who might decide to eat them, a wannabe employee with dreams of television stardom, a doctor with his own objectives, and various assassins who probably have Star Trek red shirts in their closets. Meg’s innocence and strangeness wrap her in the protection of the community at a time where strange drugs are causing attacks on Others. She controls monsters the world fears with carrots, sugar cubes, and dog biscuits. This is a strange, old world, and I was surprised to find that Written in Red was released in 2013. 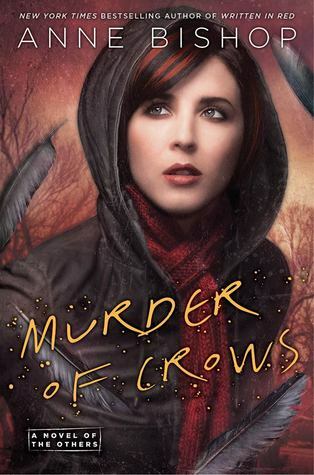 I was surprised and thrilled to learn that the sequel, Murder of Crows, was already out. Use this link to purchase Written In Red and a portion goes to help support KRL. A blood prophet–a girl who sees visions of the future when she is cut and bleeds, a world where humans are easy meat for the Wolves, Crows, Vampires and other Others who control most of the land. Those were the building blocks of the book that has been my favorite of the first third of 2014, Anne Bishop’s Written in Red. Now, the second novel of the series is upon us. In Murder of Crows, the canvas is broader, exploring more of Thaisia, a continent of Namid. Drugs are creeping across the world, drugs that make humans attack creatures that can wipe their towns from the map and cause the Others to become prey. Instead of focusing on an area less than a mile square, we are introduced to other towns and people with other talents. We meet another female bleeding-seer, one who is still trapped in a “hospital” where she is cut to make prophecies for men who are willing to pay. Meg Corbyn is one of the cassandra sangue who has escaped, working as Human Liaison, the go-between dealing with the human deliverymen who don’t want to be eaten and the Others who are trying to figure out why they don’t want to eat this strange girl who charms Vampires, gives treats and doggie beds to Wolves, and has only known the outside world through training pictures and films she was shown so she could describe her visions. There are more stories and points of view, this time, but the new cast members are skillfully drawn. They make decisions and act upon them, even the baddies who want Meg returned to their “care.” It is interesting to watch Meg’s confusion as she tries to deal with being around Simon Wolfgard, the leader of the Courtyard in the city of Lakeside, the Other community in the middle of a Human gathering large enough to have colleges and hospitals. The characters seem tentative at times, but that’s because Meg has upset the equilibrium of their societies. She is the wild card that is not for the eating, that brings together factions that never trusted each other into partnerships they never imagined, and she has a lot to learn about the world. There is mystery: what is the source of these drugs that create conflict between Human and Other? There is excitement: where are the blood prophets held? Will the Humans try to get rid of the control of the Others, or will the Others blow away the Humans in a killer storm? There is romance: will it stay on a G-rated level, or will Meg and Simon finally get past the I-think-he-likes-me-maybe stage? 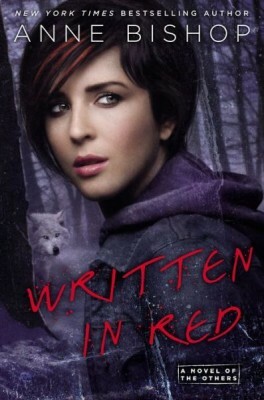 I really liked Written in Red. I definitely like Murder of Crows! And I look forward to seeing more of the construction of Anne Bishop’s amazing world. To enter to win a copies of Written In Red & Murder of Crows, simply email KRL at krlcontests@gmail[dot]com by replacing the [dot] with a period, and with the subject line “Anne,” or comment on this article. A winner will be chosen May 10, 2014. U.S. residents only. Use this link to purchase this book and a portion goes to help support KRL. I loved both these stories! Thanks so much for this chance to win these books! Anne bishop is one of my all time favorite authors. I love bothe these books and have already re read them several times. I would love to have a copy of my own. I hope I win. Love this series! Loved both of these! Would love to own actual copies so I can reread them a bunch of times! They sound like my kind of books! Godfrey, I think they are!